Gosh we've talked about Emmett's music preferences, what sports we see him playing and everything under the sun. 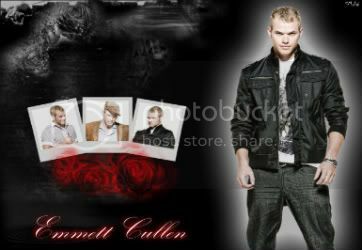 So I'm rambling right now trying to find something to talk about, Oh I got it Emmett! Hey There Elizah is now on Clean up Crew!! Congratulations! Caomb, I have for you another toy to play with. How does Dump Truck Trainee sound to you? Haha. Have fun with that. Haha. Ya, I can see Emmett being a rodeo clown! Oh my gosh. Plus, he can't get hurt, so to be funny, he'd probably purposely get hit by the bulls horns. I love Emmett he's absolutely hilarious! He's always lighthearted and jovial. All I can say is AWESOMENESS! hey cascsiany, if you want to officially join the EDC, go over to page 10 of this thread and fill out the questionnaire. Once you do that, you are in. urcoolcarrie wrote: Hey There Elizah is now on Clean up Crew!! Congratulations! congrats guys Keep it up Woot Woot! I just saw twilight for the 5th time tonight! (well, i actually saw it twice today...i love that movie. ) the first time Emmett came on, I screamed. Heck, I do that everytime. Hes so delicious. Emmett's just a loveable guy. He's the comic relief when things get stressful. Wait... what does clean up crew do? welcome to E.D.C inc. Let's break down some houses!!! !